In the octagon, they are the last guys you would want to stand nose-to-nose with. But what about at your supper table? 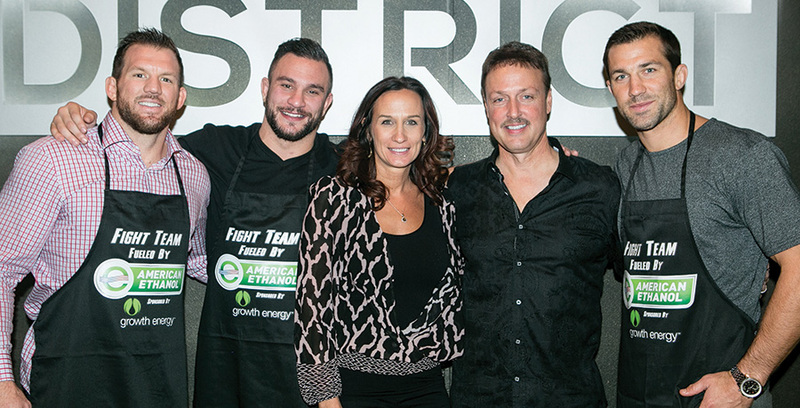 In November, three professional MMA fighters from the American Ethanol fight team spent the evening supporting POET’s Mission Greenhouse during the 2nd Annual Dine with a Fighter fundraiser. Mission Greenhouse is raising funds for its third trip to Africa to build greenhouses and infrastructure for an all-girls boarding school in Kenya, Africa. Although these fighters may not flaunt their soft side in the octagon, they are truly caring individuals who support the ethanol industry’s cause to make our country more energy independent. 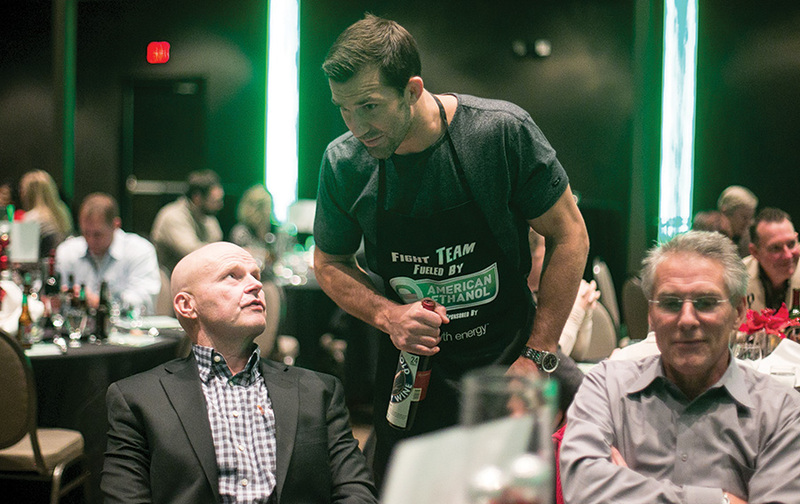 Top ranked fighters Luke Rockhold, Ryan Bader and Gian Villante served as wait staff during the event and served bottles of their own specially labeled wine. This gave the guests the chance to meet and mingle with the fighters and, of course, purchase a bottle of wine. The great salesmen they are, the fighters sold out of wine before the event was complete. Luke Rockhold sells his custom-labeled wine to Dine with a Fighter attendees. In addition to the three professional mixed martial artists from the American Ethanol team who were able to make the event, others who were not able to attend, due to training for upcoming fights, voiced their support as well. They all pooled together a generous donation from their personal foundations to support Mission Greenhouse. 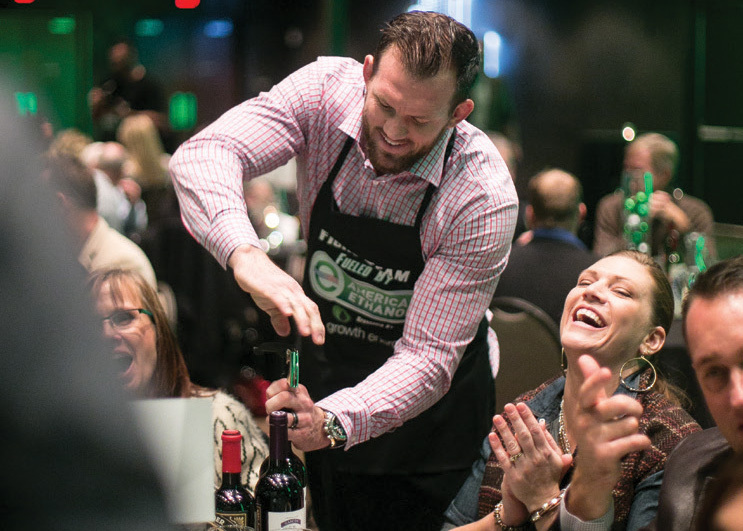 Ryan Bader opens a bottle of wine for Dine with a Fighter attendees. Though their professional pastime may seem a bit intimidating, the true heart of these fighters is one of kindness and generosity. 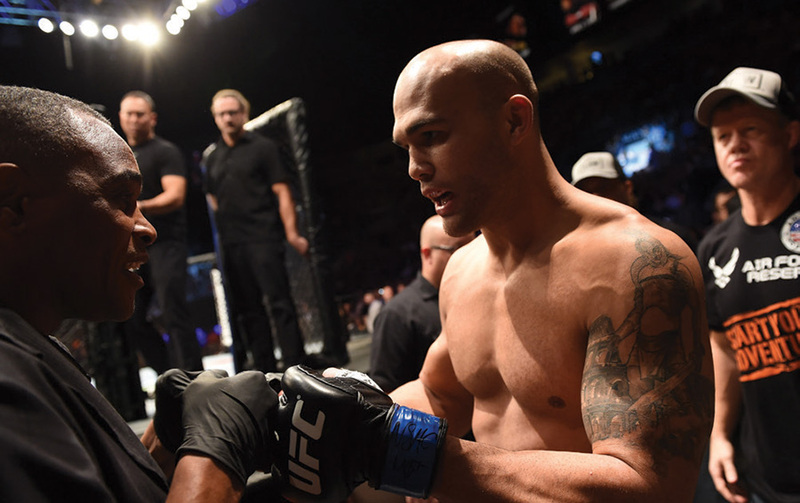 On December 6, American Ethanol fighter Robbie Lawler defeated defending champion Johnny Hendricks to become the new UFC welterweight champion. An Iowa native, Lawler received All-State honors in wrestling and football while attending Bettendorf High School in Bettendorf, Iowa. Immediately upon high school graduation he began mixed martial arts training and made his professional debut in 2001. Lawler joined the American Ethanol fight team in 2013.